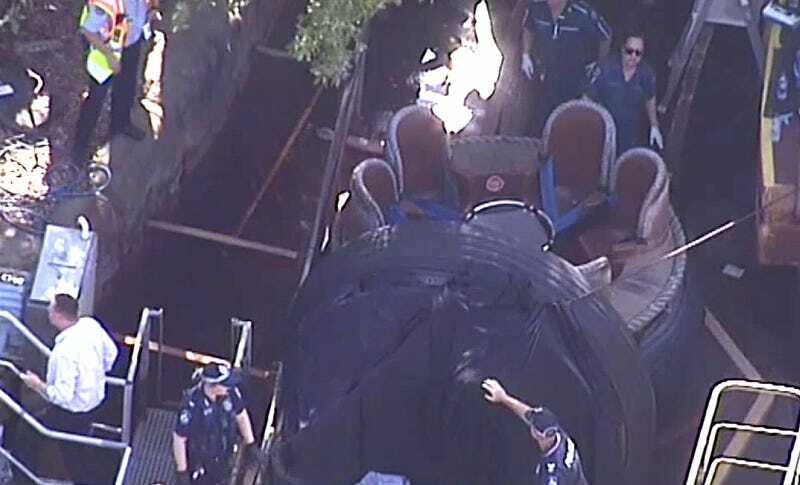 Two women and two men were killed while riding the Thunder River Rapids ride at an Australian amusement park. Earlier today, an unspecified “malfunction” on the Thunder River Rapids ride at Queensland’s Dreamworld amusement park caused two occupants to be thrown from the raft, while the other two were trapped inside. The unnamed victims are reported to be from the same family, and range in age from 32 to 42. The park has been closed while officials conduct their investigation. Early reports suggest a surge of water pushed one raft into another, causing the front raft to tip over and throw its occupants out. The ride, which is described as a “moderate thrill” attraction, involves circular rafts that move along a fast-moving artificial river. Above: A promotional video for the Thunder River Rapids ride. A Queensland police spokesperson said investigators are in the process of reviewing CCTV footage of the incident. Crews are still working to recover bodies from the scene, a complex retrieval that will require heavy equipment. It’s not immediately clear if this earlier incident had anything to do with the accident, but investigators said they’re considering everything at this time.